Not many people have ever even heard the word “scry” before, and those that have know it intimately. Find out how you can use a scrying bowl to see places you might not have been meant to see, but be careful – scrying is a two-way street. Scrying as a divination method is the system that allows someone to look into a reflective surface and see things in a different place and time. Some people equate it with the psychic phenomenon of remote viewing. The United States government invested a large amount of money into putting together a unit of psychics during the Cold War who could use their talents to spy on the Russians. Unfortunately, this investment ended in failure – The participants could not successfully and reliably spy on the Russians. The reason for this is that scrying is not a method of remote viewing, at all – scrying is a method of seeing into different worlds. Using a scrying bowl or other similar device, one can look into parallel worlds, dimensions not our own, and realms normally forbidden from man. The use of a scrying bowl is technically very simple. It is the conceptual practice that is difficult! First, your bowl should be made of a non-reflective matte surface, like marble or wood. It should be dark in colour, with black being ideal. It should be wide and shallow, though there are some people who swear by using pewter drinking goblets for this purpose. The mouth of the bowl should be as wide or wider than the reservoir, which is to say that wine-glass shaped bowls with narrower mouths will not work well. You will need several candles, ideally red, black, or grey in colour, twenty-one to be exact. Your room should be dark and quiet, and scrying is best done at night. Light the candles. Place them in seven groups of three candles in a circle around your space, making sure that nothing will catch fire while you enter scrying state. The purpose of the candles being in a circle is so that you can see their reflections in the bowl’s surface. Fill your bowl nearly to the brim with water. From this point, add your activator. To see a world like the one you are in, add a pinch of sea salt. To see a world significantly different from your own, add a drop of ink. To see into the realm of the Fae, add one drop of the oil of a flower. To see into the realm of the dead, add one drop of your own blood, taken from a pinprick. To see into your own mind, add a drop of saliva. 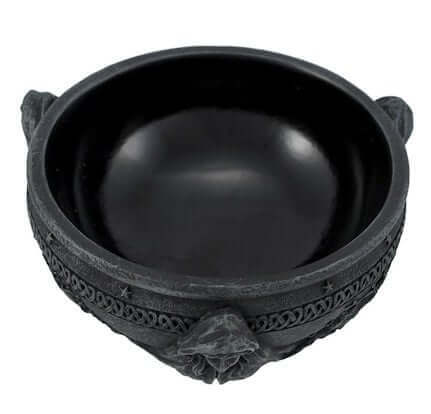 Your scrying bowl’s water is now ready to be used for scrying purposes. Begin by sitting comfortably within arm’s reach of the bowl, and close your eyes halfway. Do not squint; rather, just let your eyelids droop down a bit. Begin by breathing in slowly, through your nose. Breathe inward until your lungs cannot fill any further. Then, breathe out through your mouth, until you cannot possibly expel any more air from your lungs. This is called Full Breath. Repeat for ten full breaths, taking as much time as you need. During your breathing, concentrate on becoming aware of the surface of the water. Focus your half-closed eyes on its surface, and see if you can see any of the reflections of the surrounding candles. Let your eyes then fall out of focus, so that the bowl and the water look like a fuzzy blob. refocus and then let focus fall out several times, until your Full Breaths are finished. You are attuning your eyes and your mind to the shifting of perception that will occur during scrying. When you are ready, gaze into the surface of the water, and blow lightly on its surface. Let your eyes do the focusing for you – sometimes the images you are looking for are not in the same field of focus as the rest of the world. You may start to see things in your peripheral vision, and you might start to hear phantom noises. Let those go past – they are not your object. Focus on the surface of the water, and every small while, move your body a little to see it from a different angle. Your mind will put together for you any images you may see. Scrying is naturally blocked in places where there is a great deal of natural metal like iron and tin, so underground mineral deposits and nearby mines may interfere with your scrying attempts. Thick concrete seems also to cause trouble. If you are not getting anything at all from your attempt at scrying, it may be that the place you are using is a natural resistor to scrying, and you might try it another time and place. Do not spend too much time in one session of scrying, because as mentioned before, scrying goes both ways. A thing you see in your bowl might well see you too. Next What Is Astral Plane & Travel?